Gutters & Down Spouts are an important part of your home’s weatherproofing system. For many homeowners, their gutter system is a secondary concern and often gets neglected… Don’t make that mistake! 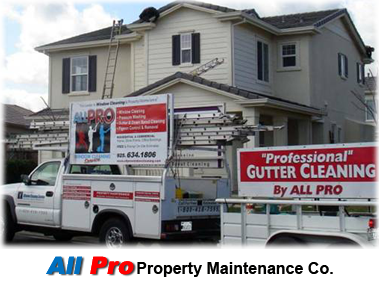 Our standard Gutters & Down Spout Cleaning is designed to ensure that you have proper drainage. Our Guarantee for Clean Gutter... We guarantee that all rain gutters will operate and drain properly for first storm after service. If any clogging or overflow is observed during that first rain, give us a call and a serviceman will return to job site free of charge and correct the problem. Customers could avoid paying thousands of dollars for these types of repairs by taking the time to properly clean and maintain Gutters & Down Spouts. This can double or even triple the life of your roof drainage system.